Line 6 Variax JTV-89 ¿Qué os parece? This FREE update of Variax firmware and Workbench software addresses a selection of performance issues and is recommended for all owners of James Tyler Variax guitars. Note: Variax v2.10 firmware is compatible with v2.00 models. 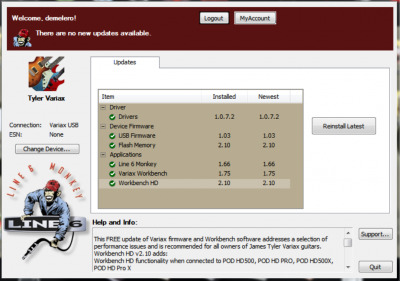 We recommend backing up your presets with Workbench before updating Variax firmware. Variax HD is a free firmware upgrade for all James Tyler(r) Variax(r) guitars. Variax HD delivers a world-class collection of HD guitars rebuilt from the ground up using Line 6's next-generation modeling technology. The team captured more detail than ever before, resulting in unprecedented sonic character and a more natural playing experience. From rare vintage electrics to classic acoustics and exotics, each HD instrument delivers superior articulation and exceptional feel - perfect for capturing inspired performances. In order to load this update, connect your James Tyler Variax guitar to Line 6 Monkey using the Workbench interface included with your guitar, or a POD with VDI input. -HD guitar and pickup modeling offers a major evolution of our Variax modeling technology. This advancement improves the playability of the guitars as well as the authenticity of their tone. -Alternate tuning of 12 strings. You can now create your own customer tunings of 12-string instruments and store them in Workbench. -With the included Workbench HD software you can blend in the magnetic pickup signal into your Variax model. -Custom patches are not retained when updating from Variax 1.X to Variax HD. In this case Variax HD update will replace all of the presets in your James Tyler Variax guitars with all-new HD guitars. Variax HD introduces the new HD preset format to Workbench HD and the guitar. Be sure to backup any customer presets that you may have for future reference; however, note that Variax 1.X presets will not work with the 2.0 firmware. For a full list of Variax HD models, please visit line6.com. For JTV-89 Customers Only: The five high-gain models that were previously exclusive to JTV-89 and loaded into custom bank 1 are now available in the Workbench software by loading the custom JTV bank available online. Variax Workbench(tm) HD is the companion editor for the James Tyler(r) Variax(r) guitars with Variax HD firmware. The all-new Workbench(tm) HD software lets you mix and match body styles, pickups, components and more to create unique instruments or revered classics. Thanks to a variety of customer-requested features, you have even more control when tweaking existing HD instruments or creating new ones from scratch. Think of it like your own personal custom shop for James Tyler Variax. Workbench HD is available as a download from http://www.line6.com/software or from within the Line 6 Monkey firmware installer application. Workbench HD is compatible with all James Tyler Variax guitars that have been updated with the Variax HD firmware V2.0 or greater. The Variax Workbench HD installer and Variax Workbench HD software provide instructions for setting up your computer, guitar and the included hardware and software. Please run the installer or the Variax Workbench HD software to view these instructions. You must be connected to the Internet to perform this installation. PLEASE NOTE: The James Tyler Variax guitar must be connected to your computer via the Workbench VDI-to-USB interface or VDI-to-POD HD-to-USB in order to use Workbench HD. OS: Windows XP, Mac OS X, Windows 7, Mac OS Snow Leopard, Mac OS Lion, Mac OS Mountain Lion, Windows 8, Mac OS Mavericks "
¿Sabéis si han cambiado los sonidos de las guitarras? La verdad es que me decepcionó mucho la versión 2.0, me gusta mucho más como suenan las guitarras en la 1.9. Gracias! No estoy encontrando información de la actualización 2.1 del firmware de la Variax... ¿alguien sabe dónde puedo mirar qué se ha actualizado/corregido? Saludos!